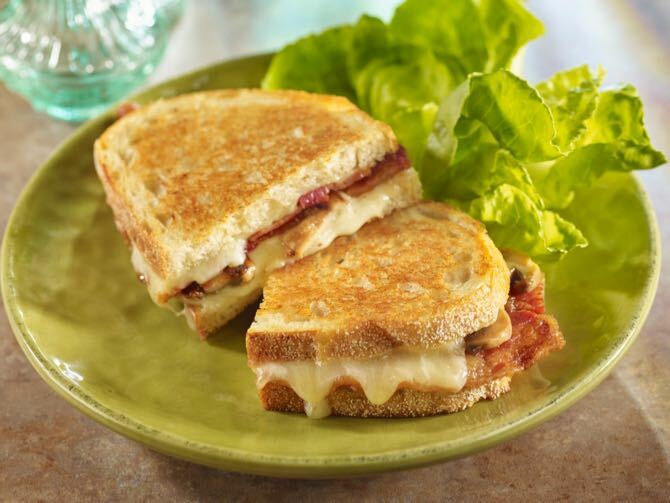 Dinner Take your grilled cheese up a notch with this tempting combination of Bacon, melted Gruyère and sautéed mushrooms. Heat skillet over medium heat. Add the bacon and cook until the fat is rendered and the bacon is close to crisp, approximately 7 to 8 minutes. Drain on absorbent paper towel. Set aside. Wipe out the skillet for re-use. Melt 2 tablespoons of butter in the skillet. Add the mushrooms and steak sauce. Sauté until mushrooms are soft and flavored. Set aside. Melt remaining butter. Brush the melted butter over one side of each slice of bread. Heat the skillet to medium. Place the buttered slices of bread in the skillet. Add one slice of cheese, two slices of bacon and a generous spoonful of mushrooms. Cover with another slice of cheese and remaining slice of bread, butter side up. As the bread begins to brown and the cheese is melting, gently press down on the sandwich. Once the bottom bread slice is nicely browned, flip the sandwich over to brown further. Serve with a side salad if desired.